these were a hit at a party! Its a simple recipe with just a great taste. Me & my friends thought it was plenty good and kept going back for more. Didnt really get what size the packet of taco seasoning was supposed to be so used a tablespoon and added chopped green peppers. I will make again. Easy to put together and very tasty. We garnished with some sour cream, chopped tomato, and green onion. We did not make them with two wonton wrappers though. My teenage son said they were almost too good to eat. These were a nice change from a messy hard shell taco. My 5 year old says he really, really wants me to make them again, tomorrow! These went over very well at a Christmas party. I did two won ton wrappers at the bottom instead of layers, they turned out well but the top of the wrappers burned and I didn't even have them in for the full 20 minutes, next time I will add more taco sauce and salsa, they started to dry out (I had them keeping warm in a crock pot). easy to follow directions. simple ingredients. Made this for dinner tonight. Tweeked the recipe bit, using a smaller muffin pan. Freezes well for quick snacks & to send in my sons sack lunch for school. Yummy and very easy to make! We had them with lettuce and guacamole. 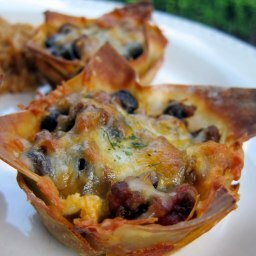 Great quick and easy dish for company! So quick and easy to make!! My family of 5 loves them!